I love cauliflower and will happily enjoy it every day when it’s in season. I also love soup. 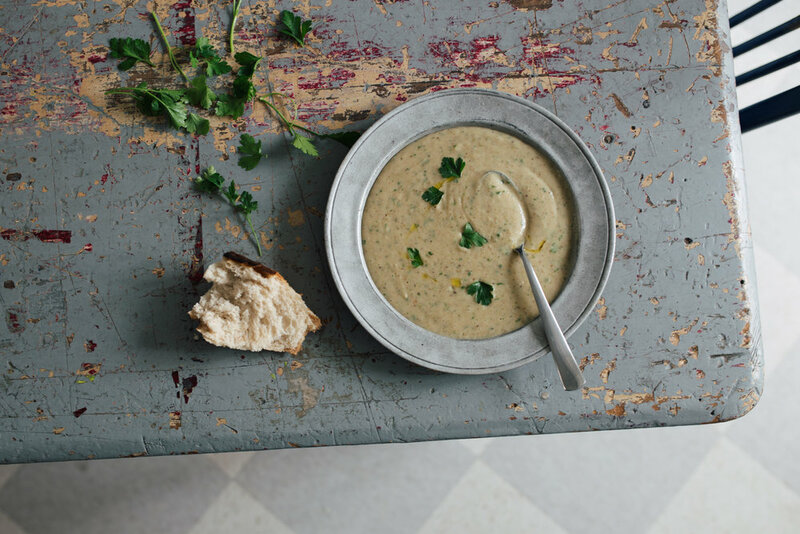 There’s something so comforting and reliable about a good soup, and any unexpected guest blown into your home on a cold, wet day would welcome a warming bowl. In this version, because we had some cooked oatmeal left over from breakfast-time, I used that to thicken the soup, for a slightly heartier version. Otherwise, leave it out. But waste not, want not. Make a stock from anything you have to hand. I just used some carrots, onion, garlic, celery and parsley for a simple vegetable stock, or you could use a chicken too. Cook the stock in a large saucepan, and when it’s ready, add your roasted cauliflower florets and cover with a lid. Simmer for about 10mins then take off the heat and puree. Season to taste. Add extra fresh herbs if you wish, and a good dash of milk if you’d like a creamier version. I always add milk to mine, but on this occasion I blended the soup with the already cooked porridge from the morning. You could add potato to thicken yours, if you like. Stevie Smith was an English poet and novelist. Sylvia Plath became a fan of her poetry and sent Smith a letter in 1962, describing herself as "a desperate Smith-addict." Amanda Holmes (my sister’s mother-in-law) is the author of a novel, I Know Where I am When I’m Falling (Oak Tree Press 2014), and many short stories which have appeared in the US, UK and Australia. Read her blog and stay tuned for a special piece Amanda has written for our next Dispatcher’s Digest in defence of Karl Ove Knausgaard. You must read Nina Stibbe if you haven’t already. Love, Nina and Man at the Helm are both delightful. And here is the link to the wonderful work of Eric Whitacre, the man behind the virtual choir Gillian spoke about. And here is a link to an interview he did with the BBC.